Here's another group of Foundry figures that I received in a generous trade from a fellow-TMPer. This time some more Russians. They are great looking figures; I rushed the process to their detriment though. I sprayed the figures with Testors Dullcote before the Minwax stain completely dried. As such, the finish is a little more satin than flat. Oh well, it'll be fine for the gaming table. I'm not up on Russian artillery, but used the illustrations in an Osprey book for the gun carriage color. Maybe too green? The figures are probably a tad shorter than current Perry and Victrix figures, but I think blend in well with them nonetheless. This unit pretty much rounds out a nice Russian brigade along with the infantry and cavalry I have. Made a pair of casualty markers using a spare plastic sprue from a Perry box. One is painted as the 60th and the other the 95th. The backpacks have decals from Alban Miniatures. The 95th guy was used pretty much as is off the sprue - except for the positioning of the arms. The 60th guy was converted a little - mainly his legs and left arm. Green Stuff was used for the repositioning. As with the other casualty markers, cheap plastic poker chips are used along with some acrylic caulking for the bases. I also painted up a Foundry Russian Artillery crew as I had left over green paint used for the Rifles. I should've waited longer for the Minwax to dry - the Dullcote is still a little shiny. My buddy Pat L. (formerly Socal Warhammer guy), having just returned from Adepticon, and I got in a nice WAB game today at the Game Matrix using 2,000pt armies. I brought my Late-Japanese army and Pat configured his for a Twilight of Greece army. Both armies are from the new Armies of Ancients WAB supplement. The Twilight army (sounds like that girlie TV show) covers the period 300 BC to 146 BC. According to the the AoA brief, the list covers, "the Greek states and alliances from the abandonment of the traditional phalanx until Greece fell under the sway of Rome." My army has some great troops - the Bushi (like Samurai) have WS and BS 4 - the foot guys have bows AND thrusting spears; the mounted guys can shoot without movement penalty. The Retainer guys (like Ashigaru) with yari are considered Close Order with pikes. I won both terrain set up and game start rolls. My luck continued when my Bushi infantry shot up his single bolt thrower enough to have his crew taken out of the game. My luck soon changed and his Cretan archers with BS 4 started to do damage to one of my Retainer archer units. Next, Pat's wedge charged into the same bow unit, which chose to stand and fight - it was too close to stand and shoot, and would surely have been overtaken if it fled cavalry. The wedge killed off all of the contacted figures on the charge; the bowmen did get to fight back with half the number of attackers in the wedge. Bad die rolls resulted in the Retainers losing the combat and subsequently fleeing; they were pursued and over taken by the wedge. The Japanese right flank did well with the Bushi cavalry unit in the first few turns; it managed to decimate the Tarentine cavalry. Later, however, it managed to get charged by a phalanx - bad positioning allowed this to happen. Losing multiple rounds of combat it too broke and left the table. Another Retainer bow unit on this flank also lost in combat to another phalanx unit. The Retainer yari unit next to it failed its Panic test and fled off the table. We played 6 turns, and the Greeks were clearly victorious. The foot Bushi and one Retainer yari unit managed to survive - as well as the general. As always, Pat was very generous in sharing his vast knowledge of game-play. He also patiently explained various options and possible outcomes. He made some suggested changes to make my army better, but I will wait until after Enfilade! to do this. They are definitely sound changes, but I don't want to reconfigure my list this close to the convention as I have to concentrate more on my Black Powder game. Oh, and speaking of Pat's generosity - he gave me a Marshal Ney figure he picked up at Adepticon. This figure was sculpted by Mike Owen and a part of the Adepticon registration - it will also be sold through Gorgon Studios. As you can see, it is a superb sculpt. I'm looking forward to painting him up. Thanks again, Pat! Here are two "tiny" units of Austrian cavalry made by Foundry. These are somewhat smaller (mainly the mounts) than current Perry models. Yet, they are indeed nicely sculpted and look fine on the table next to their larger brethren. These are Cuirassiers and 4th Hussars. From what I found on the internet, it appears all of the saddle blankets were red with yellow borders. 4th Hungarian Hussars with "parrot green" jackets and campaign trousers; the full-dress breeches were red. Their pale blue shakos really make them stand out. Here are the cuirassiers - several regiments had blue facings. Austrian cuirassiers only wore breastplates which I'm sure was a cost-savings, but also motivated the wearer to not turn his back to the enemy. Still need to fashion a unit flag. Although I had earlier mentioned that these small units would be great for Sharp Practice, I now plan to use them with Black Powder rules. Basically keep them in skirmish order and use many of the attributes in the useful rules section. Thanks to my buddy James and his Prussians, we were able to get in a very nice Black Powder game today. As the intent was for a refresher of the rules, we only fielded smaller armies on a 5 X 8' table. This actually worked out well as it had our units getting into range fairly quickly. I had two French brigades - each with two infantry battalions; one also had a light cavalry unit and the other a battery. James fielded a larger Prussian force, including two cavalry units and four artillery batteries. In the spirit of fairness he did lower his Staff rating to 7 with the French having a rating of 8. Initial French dispositions - one of the infantry battalions was in mixed order at the start. Prussian units were arranged in an "L" shape almost surrounding the French. The buildings are borrowed from my wife's collection of Christmas stuff. Here a French infantry battalion closest to the Prussian advance is being overwhelmed in close combat. This unit later failed a subsequent Break Test and left the table. The other two units of this French brigade were also later broken and left the table, but not before the artillery fired canister at close range into the Prussian cavalry. The other French brigade saw a lot of action also; here one of the infantry battalions having formed square in response to a cavalry charge is being shot at by Prussian infantry. We had agreed to 6 turns, and it was not a clear cut Prussian victory at the end of the game. In turn 5 a Prussian blunder on a brigade order ended with those units retreating away from the French. Although some of the remaining French were disordered, including the cavalry unit, it still appeared to be a stalemate. Note that we position one of the stands off center to show the unit as Disordered. It was a great refresher, and clarified some of the rules we were still fuzzy on. Even though the last time we played Black Powder was several months ago, the rules were easy to recall and the game was fast paced and fun. I'm now pretty confident of running the larger Salamanca game at Enfilade! next month. Hopefully James and I can get in another game early next month before the convention. More Foundry Napoleonics from a recent TMP trade - just four Hungarian Hussars - painted as the 4th Hessen-Homburg Regiment. Too bad they didn't come in full-dress as the red breeches would've really made these guys colorful. Hopefully, the red horse blankets should add a lot more color once they're mounted. The actual braiding is yellow and black, but I'll just let the Minwax stain give it that appearance over the yellow. Note the four Austrian Cuirassiers in the background next in the queue. I plan to combine both of these small units into one group for Sharp Practice. A Hungarian 4th Hussar in full-dress. Looks like I need to change their stirrup straps to black. I won a couple of packs of Wargames Factory plastic sashimono off of ebay; unfortunately, I only received one pack of 25. The other pack is shown as confirmed delivered - but I never received it. I filed a complaint with the USPS and they are figuring out what happened. I suspect one of my neighbors may have gotten it mistakenly and either hasn't turned it back the post office or tossed it once they saw a bunch of little plastic thingees inside. Anyway, I painted up what I had for the Old Glory Ashigaru spearmen. The patterns for both units are taken from the Siege of Osaka Castle painting. These plastic sashimono are ideal as they are light and can be twisted a bit for variation of placement. The next unit is short five sashimono; I won another pack off of ebay using the buy it now option today. As soon as it arrived (hopefully to my address), I'll add the remaining five. I'll likely add sashimono the the Ashigaru archers with the remaining one. I ran out of Minwax Tudor stain, so attempted using some Future floor wax mixed with Vallejo ink/stain. It didn't come out as nice as Minwax, so gave it a wash of Vallejo stain and added highlights. Unless I come up with a good mixture, I'm sticking to Minwax. Here are a couple of pictures of the WAB Dark Age Campaign battles we played yesterday. My Thematic Byzantines lost to Old Bob's terrible Goths. Luckily my Army General survived and I was able to retain my earlier campaign victory award of 10 percent extra points for my army. Speaking of WAB, Pat Lowinger and I are hosting a few WAB pick up/demo games at Enfilade! next month. Pat is also hosting a mini-tournament on the last day of the convention. We have 12 confirmed players - not bad as normally there is only one WAB game for the entire 3-day convention. So here they are - given a wash of Minwax Tudor Satin stain followed by Testor's Dullcote. Bavarians - painted as belonging to the Preysing Regiment. Kingdom of Italy, 5th Line Regiment. Hungarians in early headgear (except for the officer). Russian Jaegers in forage caps. These are the only figures that I added highlights to after the stain - just to the green areas. In addition to finishing these guys today, I was happy to have helped my buddy with some Wargames Factory Persians cavalry. Just a small unit that he'll use at Adepticon next week. Tomorrow several of us are having our fourth Dark Age Campaign game at the Game Matrix. I'm taking my Thematic Byzantines (actually Norman and other figures pretending to be Thematics). Last small group of the mixed bag I got in a TMP trade. Russians painted up as Jaeger in forage caps. They appear to have Brown Bess muskets - I understand that these were in limited supply from the British and given to the best marksmen. Again, these have yet to be stained with Minwax. Hopefully have that accomplished tomorrow. They will also get some highlighting after the stain. All of the Foundry here are really nice sculpts, but these Russians seem to be better proportioned than the others. I think they'd look pretty good next to the current Perry releases. I have to say, it was quite enjoyable painting a variety of uniforms in such small batches that it never became tedious or boring. Along with a few other units, I'm planning to use all of these figures in a Sharp Practice scenario called "Road to Leipzig." 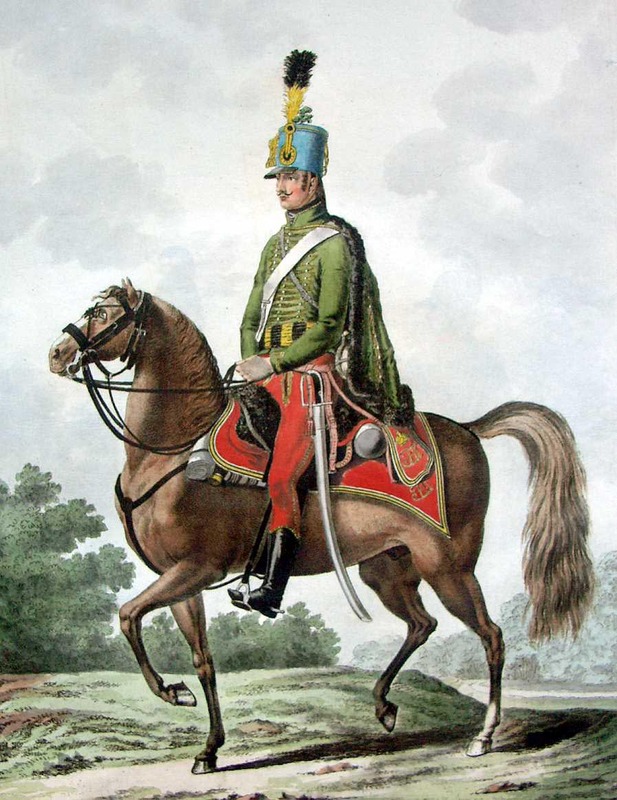 Here's a link to great uniform illustrations of the Bavarian army. Finished the two small French units - the Legere are painted up as Neuchatel Battalion Voltigeurs. Figured some could have trousers made from Spanish cloth as they served in the Peninsula before they hurried up to join the remnants of the Russian Campaign. Again, these still need a wash of Minwax stain. Here are the Ligne in full-dress painted up as Italians - 5th Regiment. Again, only a handful as these were part of the grab bag I got from a trade. Don't want them sitting unpainted any longer - they'll make for a nice Sharp Practice group - possibly paired with the Neuchatel guys. Just have a few Bavarians and Russians left; however, my buddy asked me to help him paint up some Warlord Greek Cavalry so he can use them at Adepticon - so the Napoleonics may have to wait a bit. Finished the Hungarian guys - they're in the older headgear, but I'll let them fight all the way up to Leipzig, if needed. As with the previously painted Austrians in the rear, they are awaiting a stain of Minwax. The stain will be applied when the rest of the units are painted - figure staining them all at once will save on clean up time. Next up a small detachment of Neuchatel voltigeurs. Got back from visiting my family in Hawaii today; after taking a short nap, I went ahead and started on the Foundry Napoleonic "mixed bag" I got from a fellow TMPer a few weeks ago. A small unit of Austrians received a block paint job. I'm holding off staining them with Minwax until all the other figures are painted; figure I'll give them all the stain at the same time. Here are the rest of the Foundry figures. As you can see they are in small units ranging from six to nine figures. These should work great for Sharp Practice; and in that vein they are based individually on metal washers. I plan to paint the French Legere as Neuchatel Battalion and the Ligne as Italians. Here's a photo I took the day before I left my visit - it's of the plaque up at Nu'uanu Pali commemorating the 1795 battle there between the forces of Kamehameha of the Big Island and Kalanikupule of Oahu. The Oahu defenders were driven or jumped off the cliffs by Kamehameha's forces. It is somewhat of a sacred and spooky place; the steep cliffs (pali in Hawaiian) and the strong winds lend to this feeling. When the old highway was being built in the late 19th Century hundreds of skulls were found below the cliffs - thought to be those of the warriors that fell to their deaths.